Friday, Apr 19, 2019, 1 – 5 p.m. Global climate change is changing at a faster rate due, mainly to human activities, with observable effects on socio-ecological systems. The impact of these changes is expected to be catastrophic and now, more than ever, collaborative strategies are needed to mitigate and adapt to new environmental conditions. 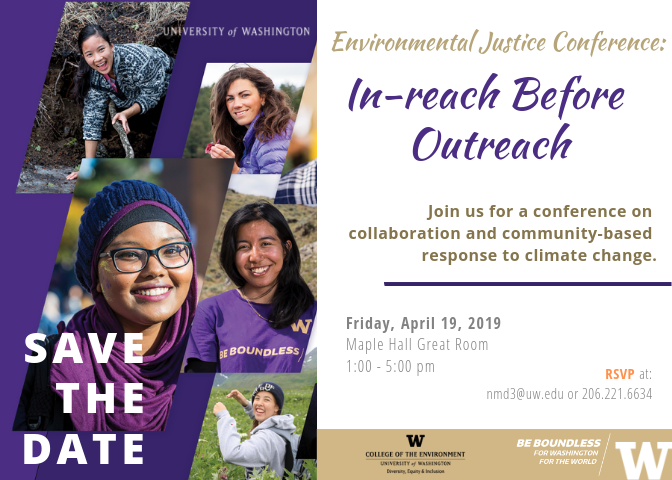 The 2019 Environmental Justice Conference organized by the Office of Diversity, Equity & Inclusion in the UW College of the Environment will focus on issues of equity and inclusive collaboration to confront climate disruption. The main goal of this conference is to reflect on our outreach strategies and look into community-based solutions. Participants will be able to engage with scholars from different disciplines as well as with local community leaders in a half-a-day program, including a panel-workshop in community engagement through participatory action research and a panel with experts in environmental coalition building.